The autumn trip to Kiptopeke finally went! Last year two Nor’easters cancelled the trip, and the year before that, not enough people signed up. So with 6 participants, Judy Montgomery and I headed down to the southern tip of the Delmarva Peninsula last Thursday. Of course, a Nor’easter was headed straight for us. This year, only one of these storms was predicted, and the heavy rain raced past us as we drove south. After the Nor'easter cleared, we watched raptors migrate past in the evening light from our porch at Kiptopeke State Park. 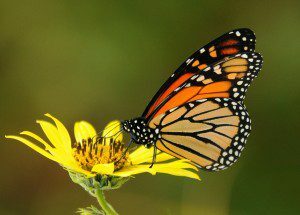 The southern tip of the Delmarva Peninsula is a wonderful place to view migratory birds and butterflies. These travelers concentrate here due to the narrowing of the peninsula, and if the weather does not permit passage over the Chesapeake Bay, birds rest and feed here in huge numbers prior to crossing. 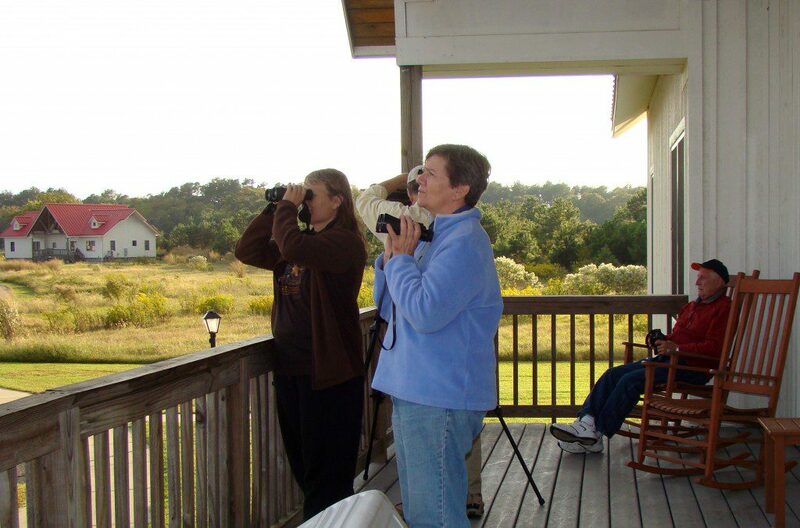 For a group, Kiptopeke State Park offers wonderful accommodations. We stayed in one of five red-roofed lodges that would be easy to see from Mars, but are situated in a beautiful meadow and are spaced out far enough where you feel isolated from other groups. 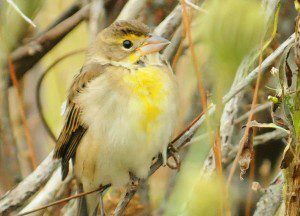 Birding is the main event for the three-day trip, and we started off about as well as you could. On our first morning, we visited the songbird banding station in the park. As the sun rose, the banders checked nets and returned with several cloth bags, each containing a bird to be banded. 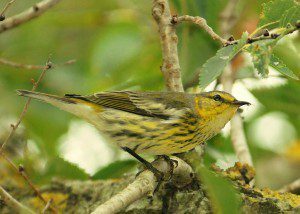 The first bird they extracted from a bag was one that I have only seen once in my life, a Connecticut Warbler! 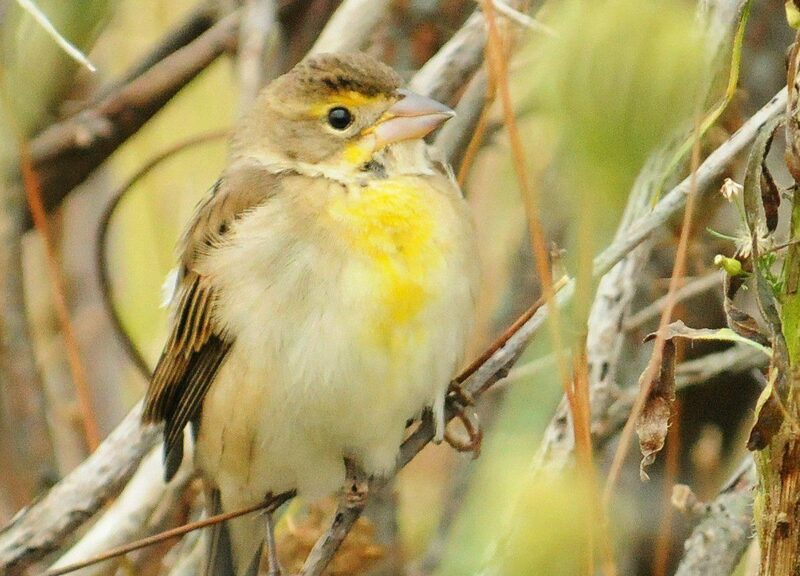 These rare birds are tough to find in the wild and are a chunky, thrush-like warbler of thickly vegetated places. We could have stopped right there and the trip would have been considered a success. 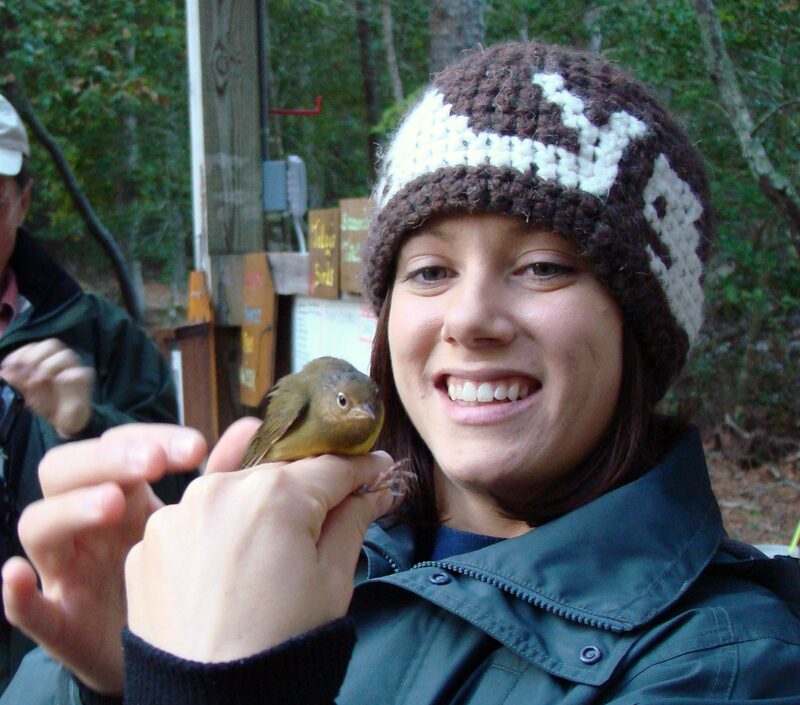 Jen, one of the banders at Kiptopeke, holds a Connecticut Warbler, the first bird of the morning. Other birds we banded and released were Yellow-rumped Warblers, Palm Warblers, Black-throated Blue Warbler, Common Yellowthroat, Song Sparrow, Swamp Sparrow, and Brown Thrasher. Following our banding session, we departed for the small fishing village of Oyster to catch a boat to Wreck Island, situated 7-miles offshore. Dot Field from the Virginia Department of Conservation and Recreation met us, but didn’t have a boat. It was too windy for the trip! Nightmares of small craft advisories and 30mph winds came true. Not to worry, though, we had a backup plan. Dot guided our group to two Natural Areas preserved and managed by the State. Savage Dunes Natural Area is unlike anything I have seen on Delmarva. This area contains a habitat called Maritime Dune Forest, which reminded me of similar places I have seen on the Outer Banks. 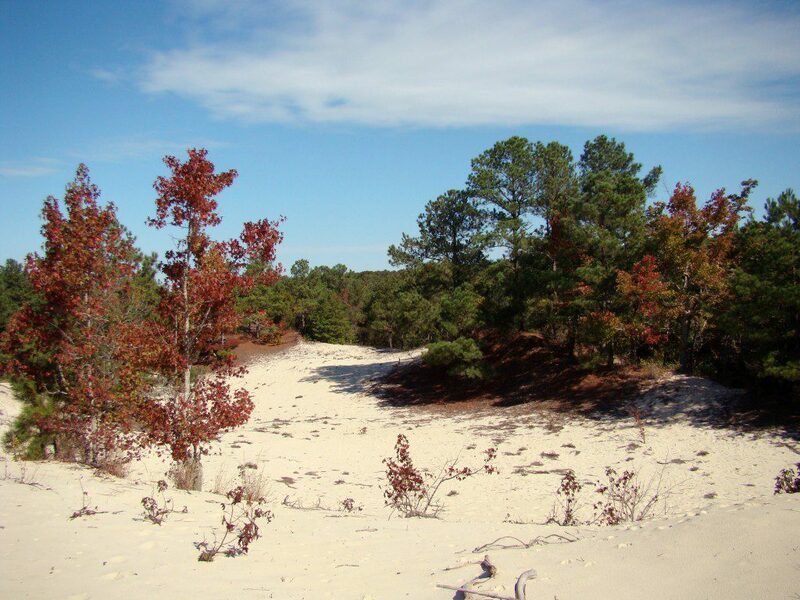 70-foot high dunes with scattered loblolly pine and southern red oak were the main feature here. 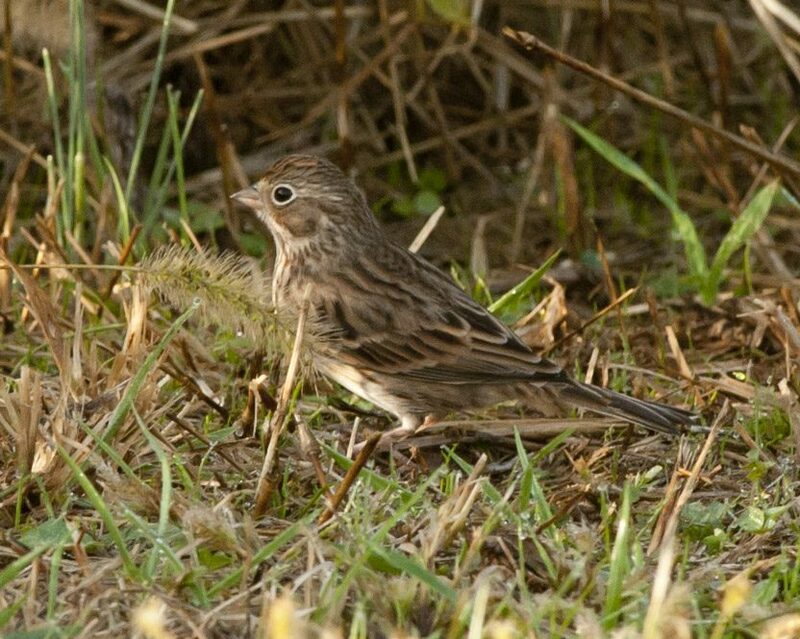 Apparently this kind of habitat is globally rare, very restricted and endangered. Here is the scene at the highest eleveation on the entire eastern shore of Virginia at Savage Dunes Natural Area along the Chesapeake Bay. Wildlife was all over this place including tiny Cricket Frogs, numerous Bald Eagles, a single Golden Eagle, lots of butterflies and dragonflies, and many, many migratory songbirds. 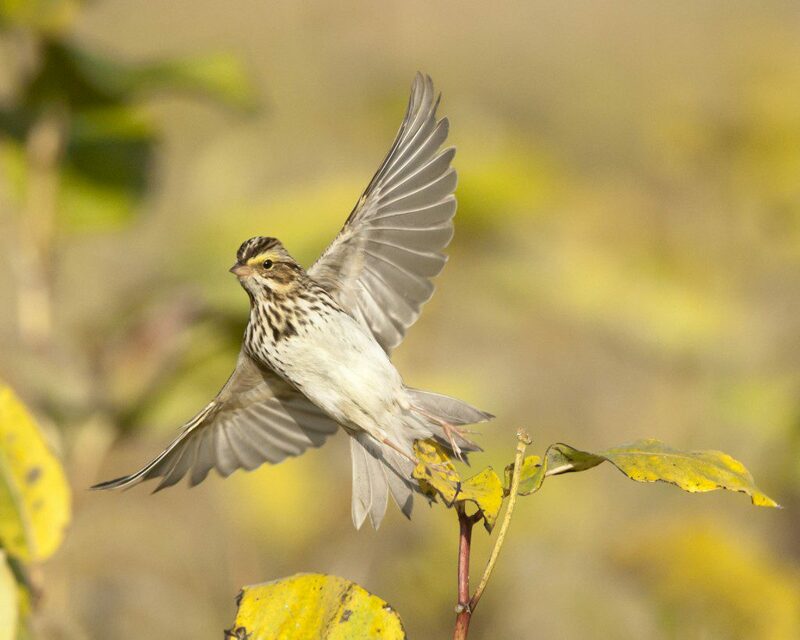 Other areas at the preserve were former farm fields that the state has let return to nature for the purpose of providing resting and feeding areas for songbirds. It was a great place for a hike. 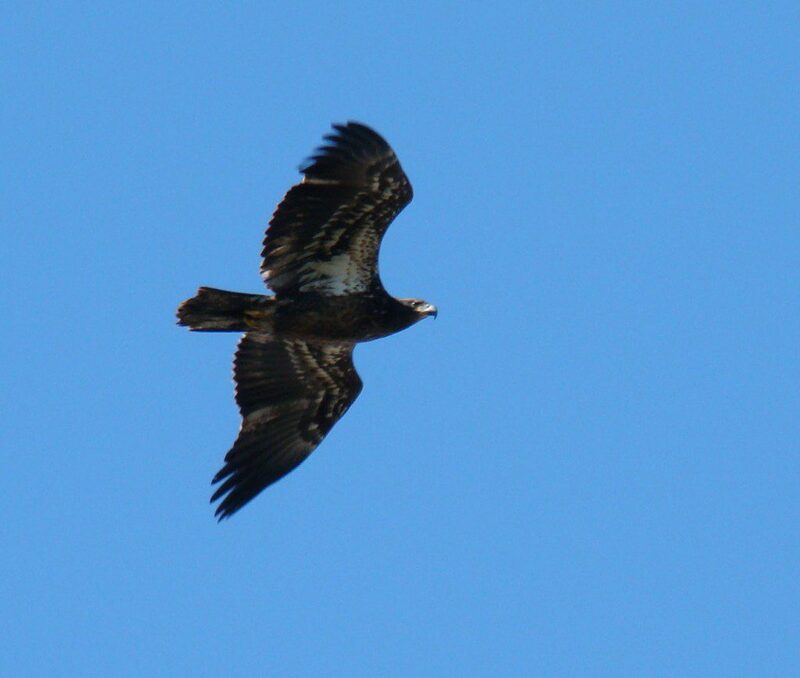 An immature Bald Eagle was one of many we saw at Savage Dunes Natural Area. 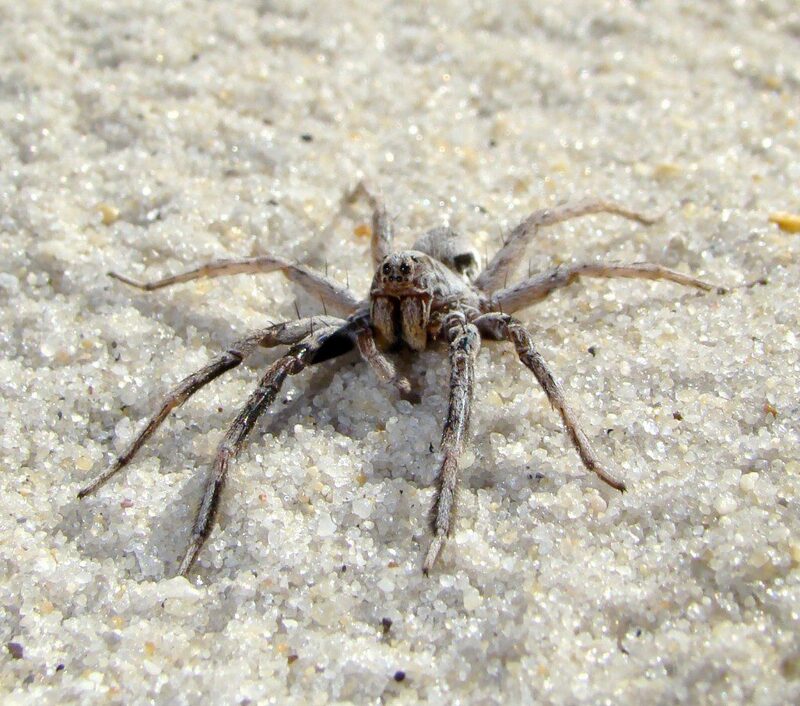 A Wolf Spider hunted for insects across the sand at Savage Dunes. The predictions of a windy afternoon bore out. We were blasted in the evening and the windows of our lodge shook all night. The sun rose, and the wind still howled. Our plan for our final day was to visit another wild barrier island, but we didn’t need a boat to reach this one. As the Chesapeake Bay Bridge Tunnel departs mainland Delmarva south, you cross an island called Fisherman’s Island, the southernmost point of the peninsula. Normally this 2,000-acre National Wildlife Refuge is off-limits to the public. On Saturdays, they offer guided tours and we took full advantage. Our guide on Fisherman's Island was a retired professor from M.I.T. He was very knowledgable about plants, wildlife, and marine life. At one point, he very excitedly pointed out a Palamedes Swallowtail butterfly, which is a rare vagrant from further south. The sustained wind was about 30mph on the island. Approximately 10,000 Tree Swallows swarmed above us like mosquitoes. Dozens of Sharp-shinned Hawks zoomed all around seeking an off-balance bird to pluck from the air or a branch. Several Broad-winged Hawks, who refused to cross the Chesapeake Bay in such a head wind, seemed hopelessly stranded as they floated around the island. The end of Delmarva was a super place to end our trip. 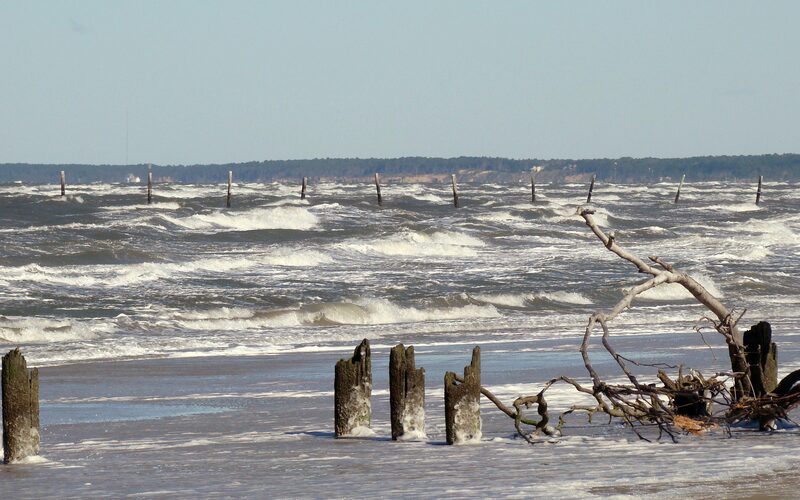 The Chesapeake Bay around Fisherman's Island was very rough in the windy conditions. Foam raced across the beach, and our eyes had to be protected from blowing sand. Looking south from Fisherman's Island, the Chesapeake Bay Bridge Tunnel crosses the bay towards Virginia Beach, the State's most densely populated area. On our side of the bridge, 20 miles away, there was nothing but woods, farms, marshes, beach, lots of wildlife, and very few people. Our Delaware Nature Society trip to the area caught sight of 94 species of birds. 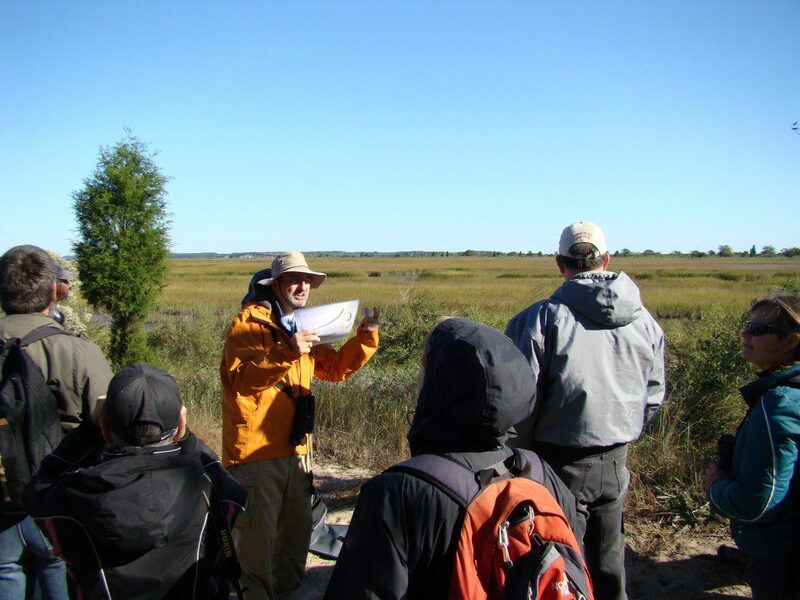 We experienced the thrill of hundreds of migratory raptors winging by, the songbird banding station, hawk watch, hikes at 2 impressive nature preserves, and Fisherman’s Island National Wildlife Refuge. 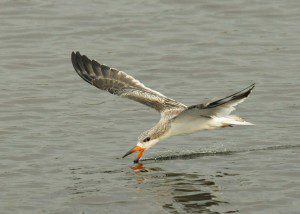 Rare birds like Golden Eagle, Connecticut Warbler, White Ibis, and Peregrine Falcon were an added bonus and it turned out to be a great trip to the southern tip. In the autumn, the best bird feeder in my yard is not plastic and filled with seeds…it is an American elm tree. This tree, which was planted in the backyard 10 years ago literally swarms with aphids each and every fall. They buzz around the tree, line every crack, and coat every branch. 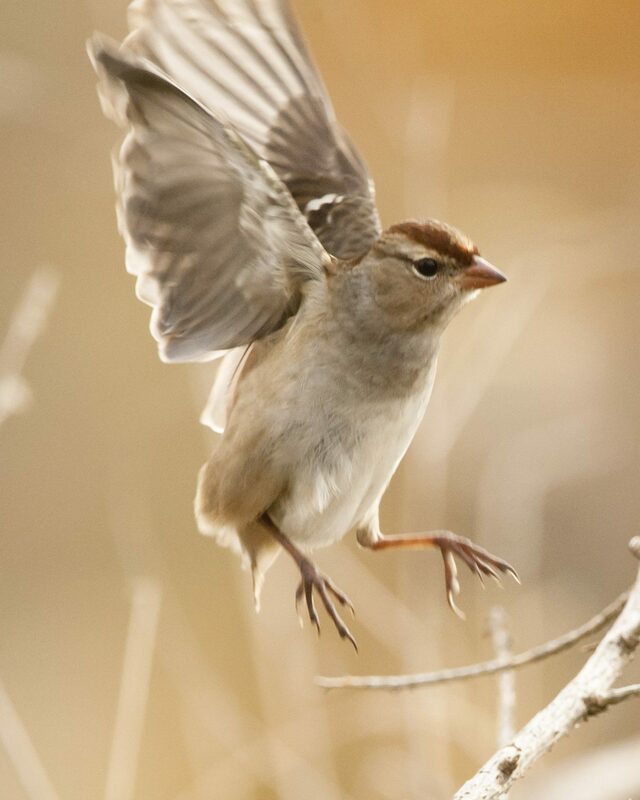 Walking past the tree, you must go through a fog of these tiny, winged insects. 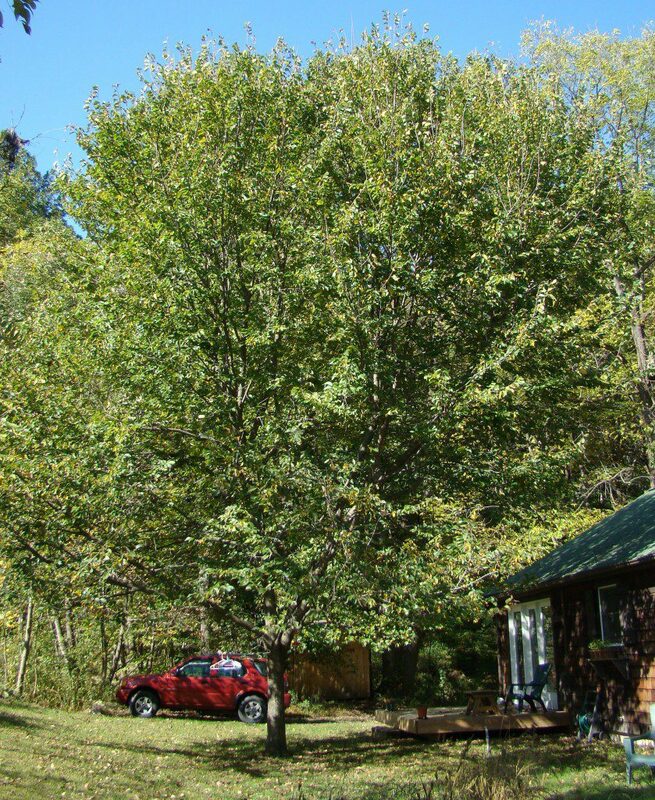 This is the American Elm in my backyard that attracts zillions of aphids in the fall. In turn, lots of migratory songbirds feast in the tree. These little insects attract small songbirds which gorge themselves at this tree from about mid-September through October. 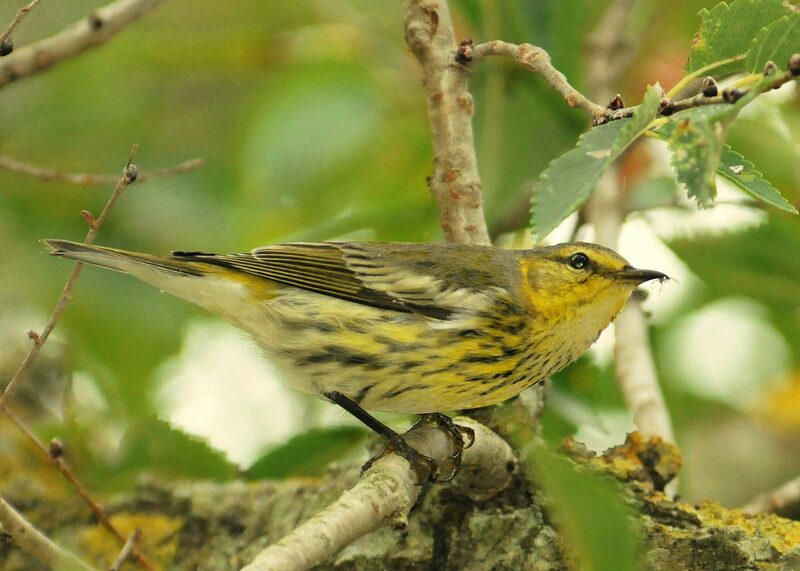 Earlier this year, a Cape May Warbler spent two days feeding at the tree. This week, a Brown Creeper inched its way up the trunk, plucking aphids at every hitch. Today, however, was the big show of the season so far. At about the same time, the following species were in the tree feeding: Ruby Crowned Kinglet, Golden-crowned Kinglet (several of each), Blackpoll Warbler, Tennessee Warbler, Yellow-rumped Warbler, Palm Warbler, Northern Parula, Magnolia Warbler, Nashville Warbler, and a Downy Woodpecker. 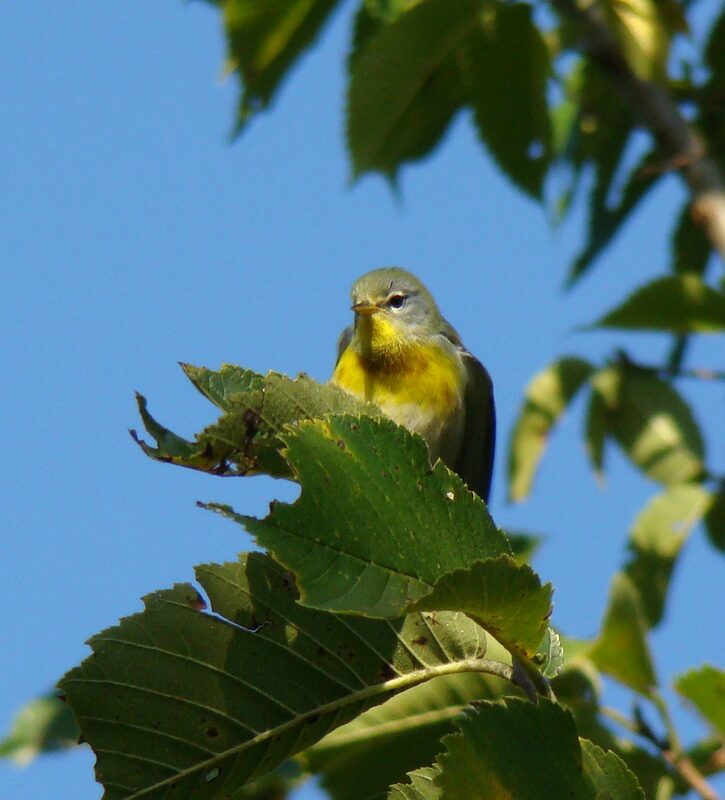 This Northern Parula hung around the tree for a while, getting its fill of aphids. 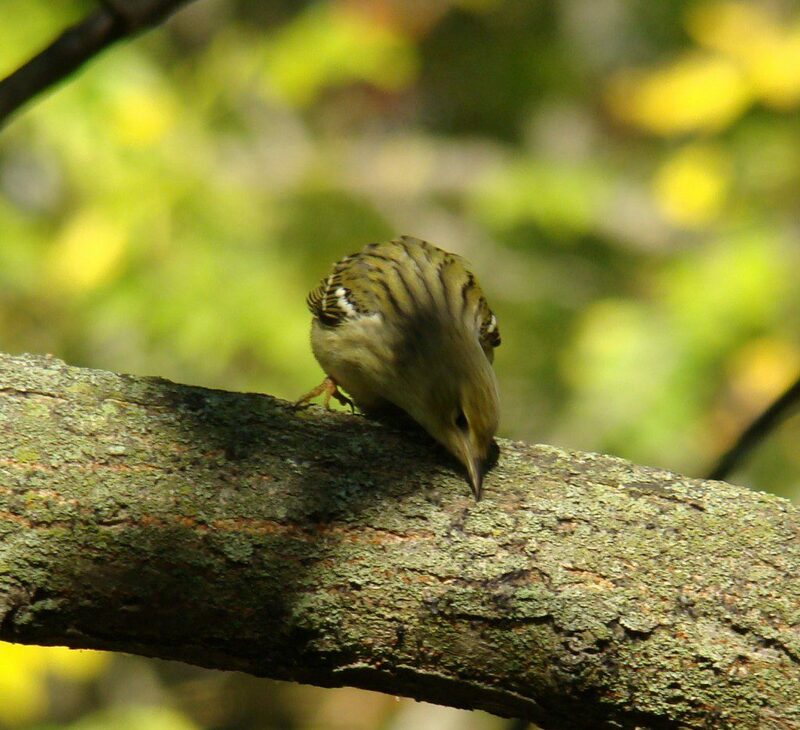 This Blackpoll Warbler fed on the tree all morning. It was very tame and allowed a close approach. Here it is picking an aphid off a branch. 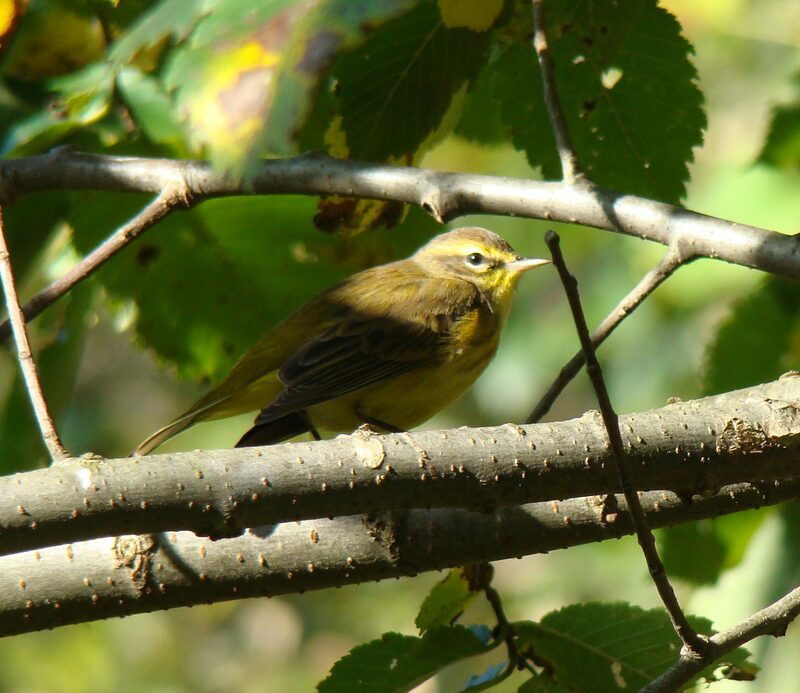 This Palm Warbler stopped in briefly to feed at the American Elm. I watched the birds feed for a few hours this morning. Mostly, they allowed me to get quite close, since they were very preoccupied with feasting on the thousands of insects that coat the tree. Later in the morning, I saw a chickadee getting in the act as well. Since I’ve never seen a chickadee eat the insects before, I looked a little harder. It turned out to be a Black-capped Chickadee, which is rare where I live in southern Chester County, PA. My resident Carolina Chickadees would rather stick to the plastic kind of feeder filled with seed. 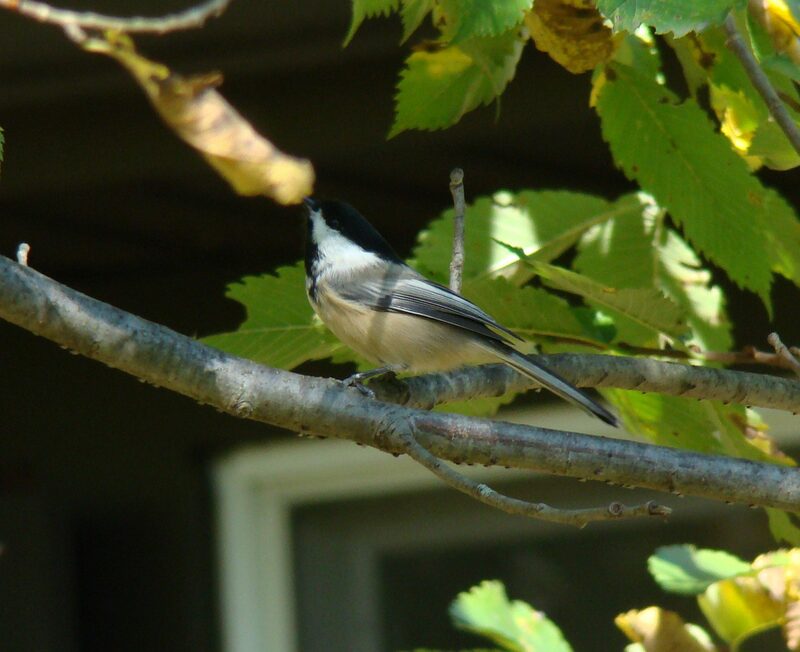 I was very surprised to see a Black-capped Chickadee feeding in the tree on insects. 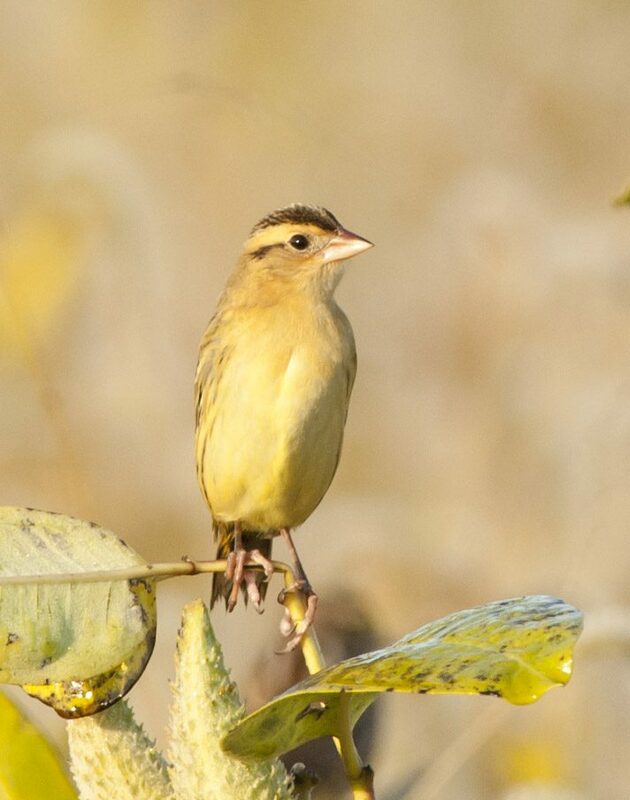 This bird is a rare migrant where I live near Kennett Square, PA. The resident Carolina Chickadees pay no attention to the aphids, preferring to feed at the regular bird feeder. This is exactly why we should plant native plants in the backyard. Native plants attract insects which attract birds and other predatory insects and so on. Today I can see how even just one tree can support dozens and dozens of birds, possibly hundreds over the course of the fall migration when they stop to refuel here. 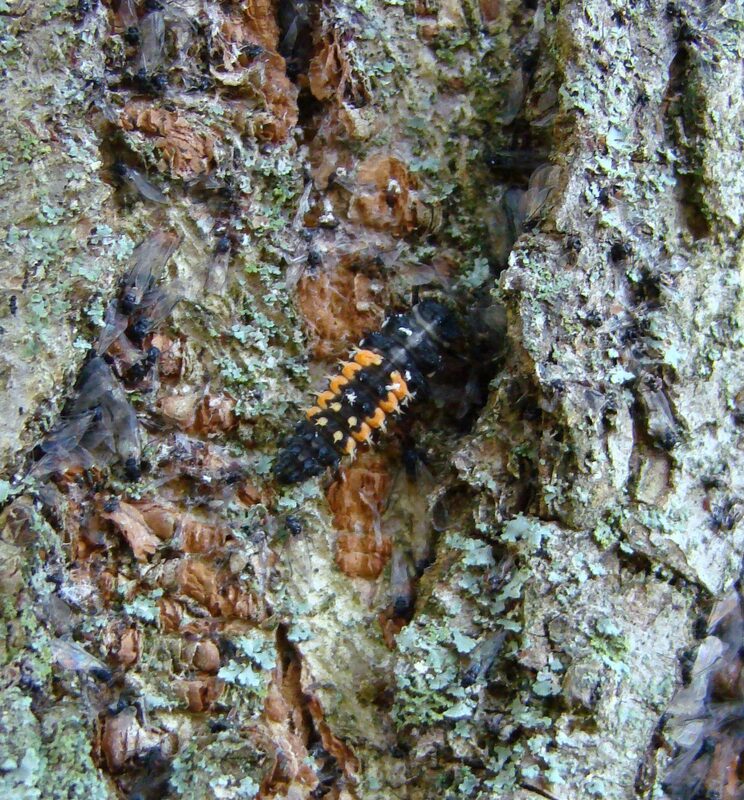 Ladybug Beetle larva are also attracted to the elm tree to eat the aphids. Check out the winged aphids all around the larva. American elms have mostly succumbed to the introduced Dutch Elm Disease and there are few in the ecosystem around us. My elm is genotype that has been developed that is resistant to this disease. Just imagine the impact American elms had in the ecosystem when they were commonly found in our area. 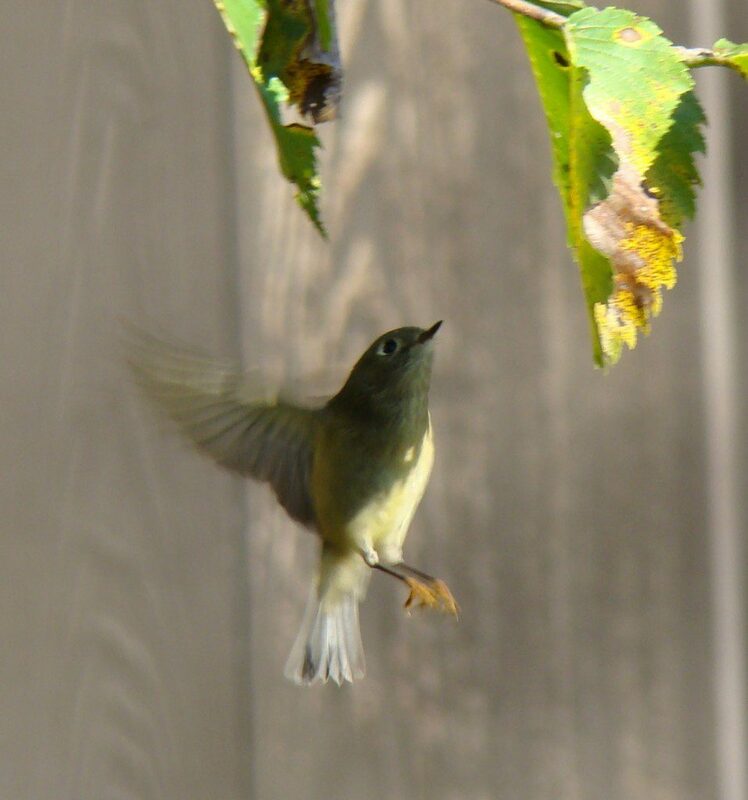 This Ruby-crowned Kinglet hovers to pick aphids off a leaf. 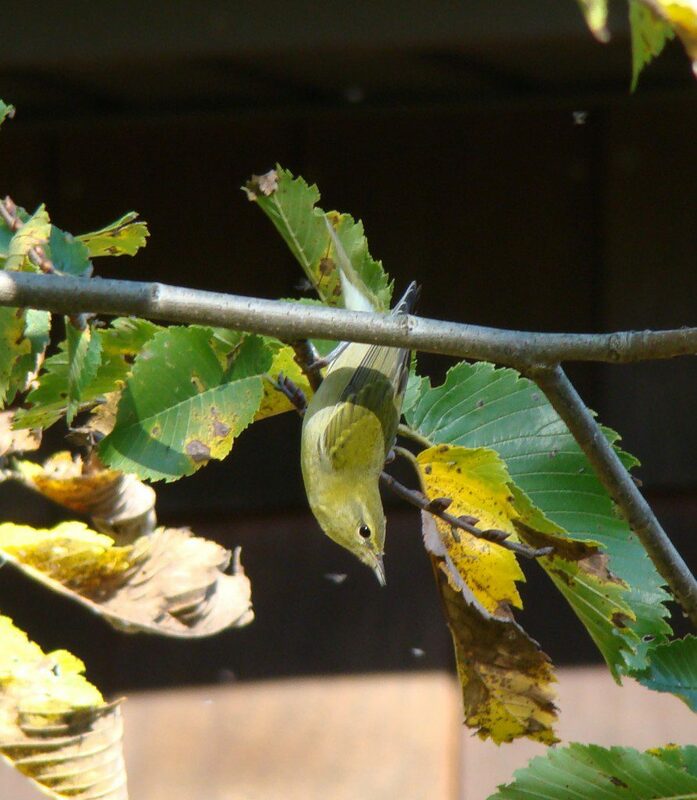 You can see some of the aphids buzzing around the head of this Tennessee Warbler, which was another fantastic bird to see in the tree. For more information on native plants in the backyard landscape, check out Bringing Nature Homeby Douglas W. Tallamy.